East Asia’s recent progress in higher education has been widely acknowledged. Yet, assessment of its future development is open to question. To some, East Asian universities are leaping ahead to even challenge Western supremacy. To others, it will soon reach a “glass ceiling.” Few have been able to theorize East Asia’s higher education development. Questions remain about the true potential of East Asia’s universities and whether they can truly break the Western hegemony. 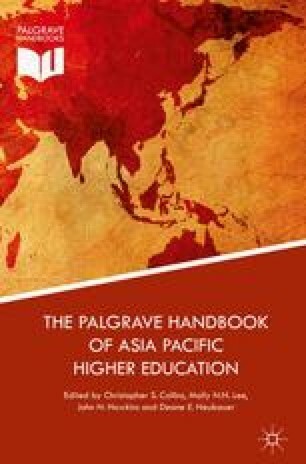 Based on both the author’s intimate knowledge of East Asian societies and his longstanding professional observation, this chapter assesses the future development of East Asian higher education systems by tracing their cultural roots. Academic Ranking of World Universities (ARWU). 2015. Academic Ranking of World Universities 2015. Available online at: http://www.shanghairanking.com/World-University-Rankings/Stanford-University.html. Accessed 24 Apr 2015. Guo, J. 2010. Academic corruption undermining higher education: Yau Shing-tung. China Daily, June 2. Available online at: http://www.chinadaily.com.cn/hkedition/2010-06/02/content_9919871.htm. Accessed 21 March 2015. Hu, J. 2014. Why do scientists commit fraud? Science, August 6. Available online at: http://www.slate.com/articles/health_and_science/science/2014/08/fraud_in_stem_cell_research_japanese_biologist_yoshiki_sasai_commits_suicide.html. Accessed 13 Feb 2015. Jung, M. 2014. Bright future for Asian universities. The Korea Times, June 18. Available online at: http://www.koreatimes.co.kr/www/news/nation/2015/01/181_159335.html. Accessed 21 Apr 2015. McNeill, D. 2014. Academic scandal shakes Japan. The Chronicle of Higher Education, July 6. Available online at: http://www.nytimes.com/2014/07/07/world/asia/academic-scandal-shakes-japan.html?_r=0. Accessed 19 Oct 2014. Mok, D. 2011. Academic accused of misconduct. South China Morning Post, June 29. Available online at: http://www.scmp.com/article/972057/academic-accused-misconduct. Accessed 21 Feb 2015. National Science Foundation, United States. 2014. Science and Engineering Indicators 2014. Available online at: http://www.nsf.gov/statistics/seind14/. Accessed 12 Apr 2015. Song, J. 2014. Plague of plagiarism tarnishes South Korea’s credibility. Final Times, September 11. Available online at: http://www.ft.com/intl/cms/s/0/28387268-26bd-11e4-bc19-00144feabdc0.html#axzz3GYrd2AC7. Accessed 19 Oct 2014. Strauss, V. 2014. For third straight month, cheating alleged on SAT given in Asia. The Washington Post, December 8. Available online at: http://www.huffingtonpost.com/2014/12/01/sat-cheating-china-korea_n_6228056.html. Accessed 13 Feb 2015. UNESCO. 2014. Educational Statistics. UNESCO Institute for Statistics. Available online at: http://www.uis.unesco.org/Pages/default.aspx. Accessed 12 Mar 2015.